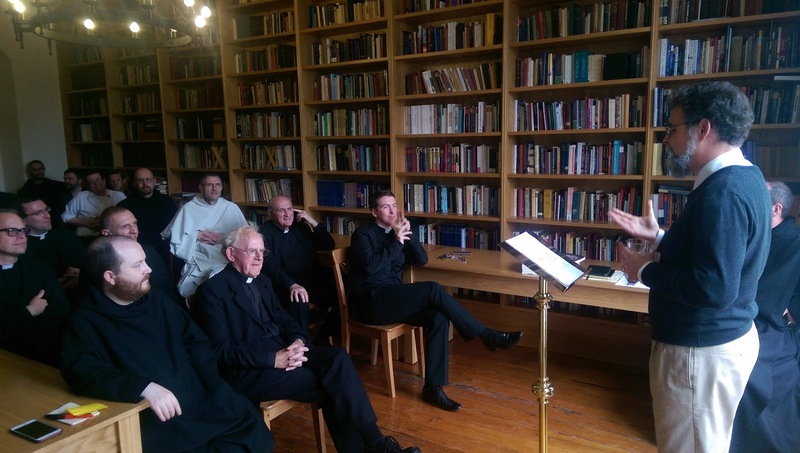 This conference was delivered to local clergy and religious at Silverstream Priory on Thursday, July 28, 2016. The text is reproduced below in full (for those who prefer it, here is an audio link). Among other topics, Dr. Kwasniewski addresses the importance and necessity of ad orientem worship. In the Epistle to the Hebrews, a climactic verse of chapter 13 exhorts us: “By Him [our Lord Jesus Christ], therefore, let us continually offer the sacrifice of praise to God, that is to say, the fruit of lips confessing to His Name” (Heb 13:15). Given the relative paucity of explicit references in Hebrews to the Christian liturgy and how it is to be conducted here on earth, this exhortation rings out all the more loudly, summoning us to a certain way of life: one in which we offer unto God, continually, the “sacrifice of praise,” which is the fruit of interior faith and its verbal confession. One might well ask: Why does the author sum up the Christian religion as a sacrificium laudis? What might we learn from the emphasis on praise? I know of no great thinker, no great advocate of justice or mercy or great keeper of an institution, who was not first an ardent laudator. I also do not know true intercessors who did not do this ministry in the context of praise. Self-forgetting praise is our foretaste of Heaven. This is the message we modern Christians need to hear in the expression “sacrifice of praise.” We are steeped in a world of pragmatism, utilitarianism, and activism, where we place such a high premium on doing and making, where we ask “what good is it” and “what’s in it for me,” where we look for results, the bottom line, the cash value, the pay-off. It is so interesting to see how Our Lord in the Gospels repeatedly refuses to lower Himself to the level of quick victories over the roiling crowds, how He insists on the disciples taking time off to recollect themselves and to pray, and, most mysteriously of all, how He Himself spends whole nights in “the prayer of God,” as St. Luke says. He who, as God, could not pray to Himself; He who, as man, was hypostatically united to the Word and therefore perpetually and perfectly communing with the Most Blessed Trinity in His human mind and heart, nevertheless really and truly exercised all the acts of prayer, including praise. In this way He revealed to us that prayer is not something superficial and optional to man but, rather, is constitutive of his inmost identity as a rational creature fashioned by God, dependent on God, and destined for God. The one who does not pray is not living as a man; in any case, he cannot inherit the kingdom that a saint, that is, a man of prayer, is competent to receive. Jesus showed His disciples that prayer is an activity as necessary and as refreshing as eating and drinking when the body needs nourishment, as vital and fundamental as breathing in oxygen and breathing out carbon dioxide. The poignant little prayer before the Divine Office brings out this point: “O Lord, in union with that divine intention with which You Yourself praised God while on earth, I offer You this hour.” This short prayer addresses Our Lord as the one who first lived and always lives the sacrificium laudis with utter completeness, with inexhaustible superabundance; we wish to unite our will to His pure, lofty, all-sufficient intention. At this point I should like to say a word about the second half of the title of this talk, namely, “the ecstatic orientation of man.” The word ecstasy is from the Greek ek-stasis, literally, a standing outside oneself. Ek-stasis captures well the paradoxical nature of the human person. First, as St. Thomas Aquinas and the entire Christian tradition teaches, man was created to find his good—indeed, to find himself, the meaning of his existence, his purpose—outside of himself. He was created looking outward, at the garden, at the animals, at Eve his helpmate; even when he looks inward, he is looking either at a mirror of the outer world or, with greater or lesser recognition, at the image of God within. Aristotle already recognized that man, as an intellectual being, is ordered to the knowledge of all that is (nearly all of which is not himself entitatively, although he can become it in the order of intentionality), and he will not be perfected except through the vision of that which is. Although we think with concepts, our concepts are, first and foremost, concepts of things that have their own existence, not concepts of concepts, which would lead us into the mental labyrinth so favored by Descartes and modern philosophers. No, we are resolutely attached to surrounding substances and their accompanying accidents. Moreover, at the level of the will, the ecstatic ordering of man is even more obvious, since man does not possess his good within himself, but receives all that he is and has as a gift from the good God, and is ordered by the same God to a supernatural state of life and perfection in glory that entirely exceed man’s own abilities to obtain them, although he has the raw capacity to receive them. In our intellectual appetite or will, we are ordered to a good, namely, happiness or beatitude, whose root cause is outside of our souls; the essence of this happiness is union with the Blessed Trinity, and its possession, therefore, takes the form of an interpersonal communion in which we are (if I may use a metaphor) perpetually gazing outwards and upwards. In these ways (not to mention others), man is ecstatic in his very nature, operation, and fulfillment. Thus we come to the second word in the phrase “ecstatic orientation.” I say “orientation” very deliberately over alternatives such as “inclination” or “vocation,” because the word contains the root “Orient,” the East. Sacred Scripture bestows this name on Christ, the lux mundi, the intelligible sun that gives light to all angels and men, the glorified body that gives illumination and warmth to the blessed. It is he who illuminates intellects with truth, and warms wills with charity. Man was made to face East, to worship the Son who rises on the world as its precondition and motor of life and the symbol of life in its blinding totality. It is not merely that we are made to be facing outwards, as our distinctively upright human posture suggests; it is not merely that we are made to know the other, to long for and move towards and embrace the good in which we find rest, to be swept up and carried away by it. We are made according to the image and likeness of the Son, and we are therefore meant to face Him, to seek and see His face, and to be His for all eternity. In an inspired editorial decision, the Catechism of the Catholic Church, at the head of Part IV on prayer, displays an icon—a miniature from the monastery of Dionysius on Mouth Athos, painted in Constantinople in the eleventh century—of the Lord Jesus teaching His disciples how to pray. In this icon, He teaches them not by giving them a lecture or by praying in a closed circle with them, but by turning around and addressing His Father. He shows them what it means to adore the Father in spirit and in truth, and they are to imitate Him, learning by doing as He does, by turning away from earthly concerns to seek God alone. In modern times we have lost the sense of sacred liturgy as an activity worth doing for its own sake, as an action whose justification lies in itself rather than in its usefulness as a tool or an instrument. Correctly understood, the liturgy is something we do for God, because He is glorious, deserving of all our love, our adoration, our devotion, our self-forgetful attention. Supplication, contrition, thanksgiving, praise, and adoration would all be meaningless if God did not exist so that we could direct such acts towards Him, on account of who He is, and for establishing us in the proper relationship with Him. We pray, we liturgize, because He exists, because we are from Him and towards Him, and He desires to hold us in being and in friendship with Him—but always, with due reverence for His great glory, a reverence that must be sincerely and unmistakably exhibited in our apparel and accoutrements, our attitudes and actions. Our love of God is not like ordinary human love or even the greatest social love for the common good. It is a love permeated with holy fear, a vertiginous abandonment of oneself to the infinitely holy, mysterious, and ineffable One. From the middle of the twentieth century through the period after the Second Vatican Council, a quite different notion arose and took over, namely, that liturgy is a service to the people, for the people, and even by the people. It is true, of course, that the liturgy is something people have to do (it doesn’t get done by itself if no one lifts a finger or a foot) and it is something that benefits us. We must, however, acknowledge a fundamental paradox: we stand to benefit precisely when, and to the extent that, we order ourselves to God as our first beginning and last end. When, and to the extent that, we act as if we were ordering God to ourselves instead, He will allow us to suffer the just penalties of restlessness, boredom, dryness, disbelief, and even despair. Nor should we underestimate the perceptiveness of the faithful in the pews, many of whom can readily sense the difference between a liturgy that is done for God’s sake, with His honor and glory as the motivating force, and a liturgy that is designed and conducted for the people, so as to involve, stimulate, affirm, entertain, or otherwise engage them. Liturgists have conveniently applied the labels “vertical” and “horizontal” to these contrary modes of worship. Yet worship as such is vertical, or there is no worship taking place at all. Joseph Ratzinger describes the worst-case scenario as follows: “The group celebrates itself, and exactly for this reason it is celebrating nothing at all, since it is no cause for celebration. This is why the general activity turns into boredom. Nothing happens if he is absent whom the world awaits.” Elsewhere Ratzinger says that when liturgy is (or has the appearance of being) oriented toward man, “it becomes an apostasy from the living God, an apostasy in sacral disguise.” When liturgy is done for man, when it is made by the group and for the group, it becomes an empty game that might amuse for a short while but has no staying power, no transcendent orientation to carry us out of ourselves, no substance wherewith to nourish our souls. This problematic notion manifests itself in many ways. One obvious example is the insistence that the laity be given things “to do” at the liturgy so that they can feel like they’re “contributing something.” It goes without saying that everyone ought to be contributing something, but we do so primarily by the act of faith and the various acts of prayer already mentioned—contrition, thanksgiving, supplication, praise, adoration—with their vocalization whenever called for by the rite, and with whatever bodily postures are suited to these acts. When, over and above this common path of participation, the laity are pressed helter-skelter into performing clerical or semi-clerical functions, particularly when it leads to the blending and blurring of distinct liturgical roles, it lends to an impression that we are the primary actors, when it is our Lord Jesus Christ who is the primary actor, acting upon us in the sacred signs. He is the one teaching us, the one ruling us, the one sanctifying us. In the Mass, He acts in a special way through His ordained ministers in the sanctuary, who are empowered to represent the Mediator between God and man, and to act on His behalf. The actions of the people should be responses to the action of Jesus Christ, rather than a group effort at “making prayer happen,” a communal enterprise like Habitat for Humanity or a soup kitchen. There is an ancient principle that says: If you aim at the highest good, you will get lower goods, too; but if you aim merely for a lower good, you will miss both it and anything higher. More specifically, when we seek what is our own, we fail to achieve it, whereas when we seek what is another’s, namely, what is uniquely owed to God, we achieve our own good as well. Our Lord taught this truth many times. “Seek ye first the kingdom of God, and his justice, and all these things shall be added unto you” (Matt 6:33). “Amen I say to you, there is no man who hath left house or brethren, or sisters, or father, or mother, or children, or lands, for my sake and for the gospel, who shall not receive an hundred times as much, now in this time; houses, and brethren, and sisters, and mothers, and children, and lands, with persecutions: and in the world to come, life everlasting” (Mark 10:29–30). “But I say to you, that to every one that hath shall be given, and he shall abound: and from him that hath not, even that which he hath, shall be taken from him” (Luke 19:26). A continual looking forward to the eternal world is not (as some modern people think) a form of escapism or wishful thinking, but one of the things a Christian is meant to do. It does not mean that we are to leave the present world as it is. If you read history you will find that the Christians who did most for the present world were just those who thought most of the next. The Apostles themselves, who set on foot the conversion of the Roman Empire, the great men who built up the Middle Ages, the English Evangelicals who abolished the Slave Trade, all left their mark on Earth, precisely because their minds were occupied with Heaven. It is since Christians have largely ceased to think of the other world that they have become so ineffective in this. Aim at Heaven and you will get earth “thrown in”: aim at earth and you will get neither. Yes, I know. It is possible to be so heavenly minded that we are of no earthly use. My problem is: I’ve never met one of those people. And I suspect, if I met one, the problem would not be that his mind is full of the glories of heaven, but that his mind is empty and his mouth is full of platitudes. I suspect that for every professing believer who is useless in this world because of other-worldliness, there are a hundred who are useless because of this-worldliness. Lewis’s and Piper’s remarks about being heavenly-minded and longing for the Kingdom are applicable to the sacred liturgy as well. We learn from the Church that our liturgy on earth is a symbol of and a participation in the worship of the heavenly Jerusalem. But in many places it hardly looks or sounds or feels that way, either because it is being celebrated by those who do not seem to care much about or to be longing for the glories of the heavenly Jerusalem with all spiritual desire, or because it is being co-opted by ideological agendas, fashionable subcultures, and bad practices that weaken, or even contradict, its representation of invisible, sacred, and transcendent realities. As an illustration of what I mean by an “ideological agenda” and the bad practices that go along with it, consider the extremely popular misconception of the Mass as a re-enactment of the Last Supper. As a result of this quintessentially Protestant idea, refurbished with shaggy carpeting in the 1960s and 1970s, the Mass was presented as a meal to be conducted in a cozy circle or, at very least, humanly face to face. This is a radically false view. The Last Supper—itself, incidentally, a solemn Jewish ceremony—was a transformation of the Passover meal as an anticipation of, and, one might say, a “pre-interpretation” of, the Passion and Death of Our Lord Jesus Christ. Our Lord’s offering of His life upon the Cross is the supreme sacrifice that redeems mankind, and the Holy Eucharist is the sacrament of this redemption. As the Council of Trent teaches, Holy Mass is not a play-acting of the Last Supper but a making present of the oblation of the unblemished Lamb on Good Friday. Bearing this dogma in mind changes not only how we will think about the Mass but also, and more influentially, the seriousness and solemnity with which we will celebrate its mysteries. It is not, first and foremost, a fellowship meal; it is a sacrificial oblation offered by the Son to the Father, the immolation of the Victim on the altar of the Cross. The correct inner attitude of the celebrant and the people is exhibited by Our Lord Himself, who accomplishes and exemplifies the total orientation of His human nature, and with it, all of creation, to the Father. Hence, the only posture that can possibly make theological sense at Mass is the traditional eastward stance, praying ad orientem. As Ratzinger shows in The Spirit of the Liturgy, it was due to poor and now thoroughly discredited historical scholarship that people equated versus populum with the practice of the primitive Church and pegged ad orientem as a late development. More thorough research, such as that of Fr. Uwe Michael Lang, has demonstrated that the view of the Church Fathers was substantially correct, namely, that the eastward stance was normative and universal from the earliest period onwards, in both the Eastern and Western spheres of the Roman Empire. This means we inherit a tradition of nearly 2,000 years of worshiping towards the East, with everyone, clergy and faithful alike, standing or kneeling together in the same direction. No symbol whatsoever more clearly expresses the ecstatic orientation of the human person and the essence of liturgy as sacrificium laudis, ordered to the glorification of God. This is why Msgr. Klaus Gamber considered the turning around of the altar and of the celebrant to be the most damaging mutation of the liturgical life of the faithful in the period of the reform. Astonishingly, the versus populum stance was never mandated by the Vatican, nor is it to be found as a requirement in any official liturgical book, and yet in the minds of most Catholics it has acquired the unquestioned status of being the very thumbprint or poster child of the liturgical reform. By this manner of celebrating, we experience, even in our bodies, the primacy of God and of adoration. We understand that the liturgy is first our participation at the perfect sacrifice of the cross. I have personally had this experience: in celebrating thus, with the priest at its head, the assembly is almost physically drawn up by the mystery of the cross at the moment of elevation. … For us, the light is Jesus Christ. All the Church is oriented, facing East, toward Christ: ad Dominum. A Church closed in on herself in a circle will have lost her reason for being. For to be herself, the Church must live facing God. Our point of reference is the Lord! We know that he has been with us and that he returned to the Father from the Mount of Olives, situated to the East of Jerusalem, and that he will return in the same way. To stay turned toward the Lord, it is to wait for him every day. One must not allow God reason to complain constantly against us: “They turn their backs toward me, instead of turning their faces!” (Jeremiah 2:27). Even if the most crucial “orientation” required of the celebrant is that of his own internal dispositions (reflected in the attentiveness, the evident love, care, and reverence he brings to the mysteries, with a peaceful, serious, and non-ostentatious ars celebrandi, and a willingness to exploit the means placed at his disposal for the elevation of the rite, for example, the use of plainchant), nevertheless, it remains true that Christian worship, as worship of the Logos, demands ultimately that we all once again literally turn towards the Lord in common: convertere ad Dominum. Fortunately, celebrating Mass facing east is making a comeback today, mainly due to the ever-increasing presence of the traditional Latin Mass, but also because there are places, especially in the United States, where bishops and priests have begun to celebrate the modern Roman Rite ad orientem. Recognizing that an overnight shift was not always possible or desirable, Ratzinger recommended the now famous “Benedictine altar arrangement,” whereby the use of six candlesticks and a crucifix on the altar can function as a sort of “rood screen.” This arrangements reminds both priest and people that the Mass is about Him and not about us, or rather, about us only inasmuch as we are united by Him, in Him, and for Him. The Benedictine altar arrangement is undoubtedly a commendable step in the long-overdue restoration of the sacred, but it is provisional of its very nature, a makeshift solution. If what I said earlier about the ecstatic orientation of man is true, it follows that our literal orientation at the Eucharistic liturgy—our facing east, towards Christ represented by the horizon of dawn, the apse, the sanctuary, the crucifix, and the altar, and substantially present in the Blessed Sacrament—is not just an old custom or a pretty convention; it is the foundational symbol of Christian anthropology, a first principle of ascetical-mystical theology, a school for learning right habits of mind and heart. One might say, provocatively, that unless the priest imitates Jesus as depicted in the icon at the head of Part IV of the Catechism by turning his back to the people and facing the Father alone, he will never be able to teach them how to pray. If he cannot show them in a vivid and unmistakable manner that prayer is about Someone and Something other than they and their concerns, he is not leading them into communion with God. We are creatures of flesh and blood who learn through our senses. The right externals in the liturgy do far more to form Catholics in the true faith and in the mind of the saints than a mountain of sermons, pamphlets, books, videos, or diocesan programs by themselves. In conclusion: If we understand what liturgy is, and, in particular, what the Holy Sacrifice of the Mass is, we will grasp immediately that its external symbols, its texts and chants, its entire ars celebrandi, ought to be unambiguously theocentric—directed to God, for the praise of His glory, as an exercise of the greatest of all moral virtues, the virtue of religion, and as an exercise of the theological virtues of faith, hope, and charity, which are infused by God and directed to Him as their definitive object. The liturgy “works” for man when, and to the extent that, it looks like what it essentially is. We must therefore help ourselves with, and to, all that Holy Mother Church provides for the living of a life of praise: the chant of the liturgy, which uplifts and renews our spirit; the splendor of solemn ceremonial, which compels us to take seriously that which is, in truth, most serious; the careful observance of rubrics, because they bring discipline to our “undisciplined squads of emotion”; meditation on the antiphons, prayers, and readings, which are a treasury of doctrine and a spur to devotion; lectio divina, which illumines our mind and warms our heart. These things and others like them are the means and methods by which we acquire the mind of a laudator, one who lives in order to praise; they are the “tools of the trade” for every Christian apprentice in the workshop of the Master. It is not for nothing that the Rule of St. Benedict has been, for so many centuries, the favorite guide for aspiring artisans of the sacrificium laudis. St. Benedict establishes an entire way of life that has its beginning and its end in the opus Dei, which is really another way of saying the sacrificium laudis; every practical detail of the Rule is ordered to facilitating this highest and best of human acts, or more truthfully, this theandric act, at once God’s and man’s. The contrast between two visions of worship—the modern, horizontal, populist, fellowship vision and the ancient, vertical, hierarchical, sacrificial vision—is no mere theoretical dispute, but a chasm that separates Protestantism and modernism on the one hand from Catholicism on the other. We have a lot of rebuilding to do, and the time is short. Fortunately, the Lord provides us with one new generation after another, and today’s youth are either terribly indifferent to religion or hungry for something far more substantial than the pablum so often spoonfed to the sheep of the post-conciliar period. We must not disappoint them in their quest for true religion, which begins with an absolute conviction that God is our all, our Alpha and Omega, and that our worship is from Him, with Him, and for Him. Whenever and wherever our liturgies display that truth in all its healing and elevating splendor, the longed-for renewal of the Church will have begun in earnest. For a good treatment of the verses that pertain to the Eucharist in Hebrews, see Shane Kapler, The Epistle to the Hebrews and the Seven Core Beliefs of Catholics (Kettering, OH: Angelico Press, 2016), 101–17. This is why it is most unfortunate that the reform of St. Pius X in 1911, by spreading out Psalms 148-150 over successive days, significantly lessened the character of pure praise that had belonged to Lauds since time immemorial. It has been argued that the ancient Jews prayed Psalms 148-150 each day; Our Lord may very well have used these psalms as His morning prayer. In the Liturgy of the Hours promulgated by Paul VI, Morning Prayer, greatly reduced in content, suffers a further loss of its original atmosphere. Logic studies concepts about concepts, but logic is piggyback on metaphysics, or to put it in more everyday language, you can’t talk about talk or think about thinking unless you first have something to talk or think about. See Thomas’s comments on why man stands upright: Summa theologiae I, q. 91, a. 3. Indeed, St. Thomas says in many places that we offer worship to God on account of our needs, not because God needs it from us: “We pay God honor and reverence, not for His sake (because He is of Himself full of glory to which no creature can add anything), but for our own sake, because by the very fact that we revere and honor God, our mind is subjected to Him; wherein its perfection consists, since a thing is perfected by being subjected to its superior, for instance the body is perfected by being quickened by the soul, and the air by being enlightened by the sun. Now the human mind, in order to be united to God, needs to be guided by the sensible world, since ‘invisible things . . . are clearly seen, being understood by the things that are made,’ as the Apostle says (Romans 1:20). Wherefore in the Divine worship it is necessary to make use of corporeal things, that man’s mind may be aroused thereby, as by signs, to the spiritual acts by means of which he is united to God” (Summa theologiae II-II, q. 81, a. 7); “we employ words, in speaking to God, not indeed to make known our thoughts to Him Who is the searcher of hearts, but that we may bring ourselves and our hearers to reverence Him. Consequently we need to praise God with our lips, not indeed for His sake, but for our own sake; since by praising Him our devotion is aroused towards Him, according to Psalm 49:23: ‘The sacrifice of praise shall glorify Me, and there is the way by which I will show him the salvation of God.’ And forasmuch as man, by praising God, ascends in his affections to God, by so much is he withdrawn from things opposed to God, according to Isaiah 48:9, ‘For My praise I will bridle thee lest thou shouldst perish’” (Summa theologiae II-II, q. 91, a. 1). I am not claiming that the faithful who perceive the difference will always and necessary prefer the more sacred form of liturgy. In fact, due to bad habituation, it will often happen that they like the horizontal mode and are offended when confronted by a more vertical liturgy. On the other hand, there are countless stories (many recorded in print in such places as Mass of Ages) of people who attend a truly vertical liturgy for the first time—it is almost always in the usus antiquior, although David Clayton records his conversion experience at the Brompton Oratory’s elevated usus recentior—and are carried out of themselves in a profound encounter with God. In any case, the argument about how liturgy should be done has everything to do with what liturgy is, and does not rest on statistical probabilities of resulting conversions, even if it is true that more conversions would result. If only church authorities would try the “experiment of tradition,” they might be surprised that God would bless them with an abundant harvest of souls. Ratzinger, A New Song for the Lord, p. 117; cf. remarks on the golden calf in The Spirit of the Liturgy. The Spirit of the Liturgy, p. 23. See Joseph Shaw’s superb critique of the implicit clericalism of this entire approach, e.g., http://www.lmschairman.org/2016/05/clericalism-and-clericalisation.html. This is the relationship between love of God and (well-ordered) love of self as St. Thomas Aquinas understands it. C. S. Lewis, Mere Christianity (San Francisco: Harper, 2001), 134. John Piper, “I Do Not Aspire to Be a ‘Regular Guy’,” http://www.desiringgod.org/articles/i-do-not-aspire-to-be-a-regular-guy, accessed July 28, 2016. Note that, of the Seven Last Words, three (the first, fourth, and seventh) are obviously addressed to the Father, while the fifth and sixth can plausibly be seen as similarly addressed. Taken in connection with everything else discussed in this lecture, we can see that versus populum is a fitting symbol of the Enlightenment-inspired anthropocentric turn in theology, liturgy, catechetics, homiletics, and every other area of Church life in the past half-century. One might almost say it was inevitable that a new, modern liturgy would have to be celebrated in a new, modern way. It is no different than the plight of sacred music: Paul VI openly stated that the “incomparable Gregorian chant” had to be sacrificed on account of the new liturgy, as if recognizing that, in spite of what Sacrosanctum Concilium had said, this ancient music would not harmonize with the spirit of the Bugnini liturgy. See interview at http://m.ncregister.com/daily-news/cardinal-sarah-how-to-put-god-back-at-the-center-of-the-liturgy/, accessed July 5, 2016. We say that sacraments effect what they signify. The liturgy, too, in an analogous sense, brings about in our souls that which it symbolizes—and it will do so only when its symbols are pure, focused, righly directed. T. S. Eliot, Four Quartets, East Coker, V.11.